This single was Marvin Gaye’s breakthrough, in more ways than one. Both sides are indicative of the giant steps Marvin had taken in his successful quest to get himself a hit, and this B-side is particularly illustrative. Raw, rough-edged, raucous, it’s a summing-up of everything his previous singles weren’t. Audiences lapped up the “new” Marvin Gaye with the same zeal with which they’d left his other records on the shelves. 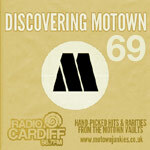 However galling it may have been for Marvin himself to discover, Motown had been right all along – he may have wanted to be a supper-club crooner, but he was a natural R&B star. Along with producer William (“Mickey”) Stevenson, Gaye picked up writing credits for both sides of this single; the A-side is clearly the stronger song, but this B-side would have made a fine single in its own right. Built around a solid, muscular, lolloping groove, Marvin and the Vandellas again turn in some strong vocals. Marvin also brings feeling to the lyrics, a story about how the narrator could have indulged in a bout of schadenfreude (“I could have laughed and said “I told you so”… I could have said that you had it coming to you when you walked out and turned your back on me”) when his ex-girlfriend inevitably got dumped by her new squeeze, but he knows no good would come out of it, because deep down seeing her get her heart broken brought him no pleasure. The middle eight (the He said he had you / Dancing on a string bit) is especially good, heartfelt delivery and a pretty tune, but really the whole thing comes together very well, built on the charisma of its leading man. Like it or not, Gaye was undeniably in his element. Raynoma Liles Gordy, “Miss Ray”, here gives one of her last big performances with her little Ondioline synthesizer. Motown were moving on, and with Funk Brothers pianist Joe Hunter taking on more and more keyboard parts, and Johnny Griffith arriving into the mix, before too long Miss Ray’s parping Ondioline would no longer be heard on any Motown singles. Soon, Motown acquired a proper “serious” electric organ (a Hammond B3), as well as a full-on nine-foot Steinway concert grand piano, and Miss Ray’s studio contributions – so vital in the early, cash-strapped years of Motown – were no longer needed. It works well here, though. Opening with a steady crash of drums before settling into a locked groove of steady backbeat, cymbals, cowbells and stabs of Ondioline, it’s a slow-to-midtempo number, definitely rough-edged R&B-pop rather than smooth-edged blues, that rocks along with a consistent pace and some great backing vocals. In front of it all, there’s Marvin Gaye, electric, mesmerising, a star in the making. America had seen his future, just as Motown had done a year before, and it wasn’t knocking out MOR pap like Mr Sandman. The die was cast, and there really was no going back from here. Gaye did attempt it a couple of times anyway; his increasing stock at the company, and his highly changeable moods, meant he was indulged by Motown in cutting two more LPs of smooth jazz and standards, When I’m Alone I Cry and Hello Broadway, in 1964. Entirely predictably, both albums tanked. Meanwhile, the public couldn’t get enough of the “new” Marvin Gaye. Both sides of this single featured on Marvin’s second LP (and first “proper” album), titled That Stubborn Kinda Fellow, released in January of 1963. This is one of the Motown 45s that I hurriedly bought in the mid-70s, while I still could get an original pressing among the sitting stock in major retail record chains. Unlike many of the majors, such as Columbia and RCA, here in the states, Motown waited until 1972 to inaugurate its own ubiquitous ‘double A side’ oldies label (“Yesteryear”). But once I saw it on the market, I knew the days of finding fresh copies of my Motown 60s favorites with their intact, original b-sides would soon be ending. I had to get a move on and I knew it, and spent heavily on ‘old’ Motown the rest of the decade while everybody else was buying up new disco. In the case of artists who got little or no album releases -Kim Weston, Eddie Holland, Brenda Holloway, The Velvelettes & Contours- the urgency was particular. Not every holy grail was hunted successfully, but I like to think I captured most all of the essentials. You lucky fellow! In the UK, original 45s are even harder to find; the three UK labels that picked up Motown releases before 1965 (London American, Fontana and Oriole) only released a select handful of singles, and the post-65 UK Tamla Motown label had a quite divergent catalogue to its US counterparts. These are both rare in themselves, and also clog up record fairs, secondhand shops and the like so you can’t find a lot of US issues. It’s http://twitter.com/radionixon – though there’s no content there apart from these updates, so you’d be just as well using the RSS feed option. Although bought new by me, I don’t think I played this side. I would just as soon hear Stubborn again. @Nix—it always freaks me out to see an early motown release with the latter day logo. Its like something from the “Outer Limits” or the “Twilight Zone”. Who knew these things existed?